These spruce oversize twill report covers from GBC help create a professional presentation that's sure to impress. The ridged oversize covers are made from 50% recycled material and embossed with a uniquely elegant and fine vertical ridge pattern. Measuring 8.75" x 11.25", these spruce twill covers are just perfect plain, but they can be used with foil stamping or offset printing as well. 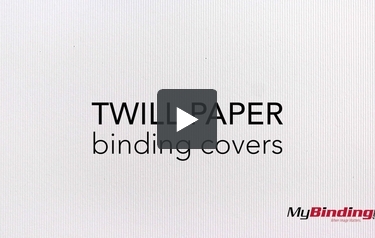 Our 8.75" x 11.25" twill covers are also fully compatible with virtually any binding system (see list below), and we're happy to pre-punch your covers in the pattern you prefer. The look and feel of these covers make them one of the most popular that we carry, so be sure to snag the right GBC twill cover today. (This particular cover is numbered 25340).